EL PRIMER SONIDO RÍTMICO QUE ESCUCHA UNA PERSONA ES EL CORAZÓN DE SU MADRE. USO DE ÉL PARA CREAR ESPECTÁCULOS REALMENTE BELLOS, IMPRESIONANTES Y ENÉRGICOS. MISMO ES INCREIBLEMENTE PODEROSO Y TRANSFORMADOR. RITMO: SURGE DE NOSOTROS DE UNA MANERA NATURAL E INSTINTIVA. JUEGO: AGILIZA LA RAPIDEZ MENTAL Y FOMENTA LA INICIATIVA. MOVIMIENTO: AUMENTA LA COORDINACIÓN Y LA PSICOMOTRICIDAD. ENTRENAREMOS NUESTRA ATENCIÓN Y CONCENTRACIÓN PARA MEMORIZAR LA PARTITURA. DISFRUTAREMOS SACANDO NUESTRA ENERGÍA Y CONVIRTIENDOLA EN MÚSICA. ACTIVAREMOS NUESTRA IMAGINACIÓN E IMPROVISACIÓN PARA CREAR NUESTROS PROPIOS MOVIMIENTOS. *PRESENTACIÓN DEL TAIKO, ORIGEN Y USOS. *CALENTAMIENTO Y DINÁMICAS DE GRUPO. *CREACIÓN DE LA PIEZA MUSICAL. *PUESTA EN COMÚN Y RELAJACIÓN. NO SON NECESARIOS CONOCIMIENTOS MUSICALES PREVIOS. 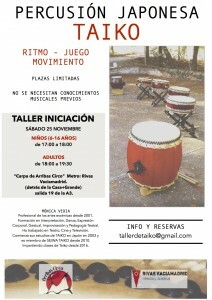 DESDE 2010; IMPARTE CLASES DE TAIKO DESDE 2016.